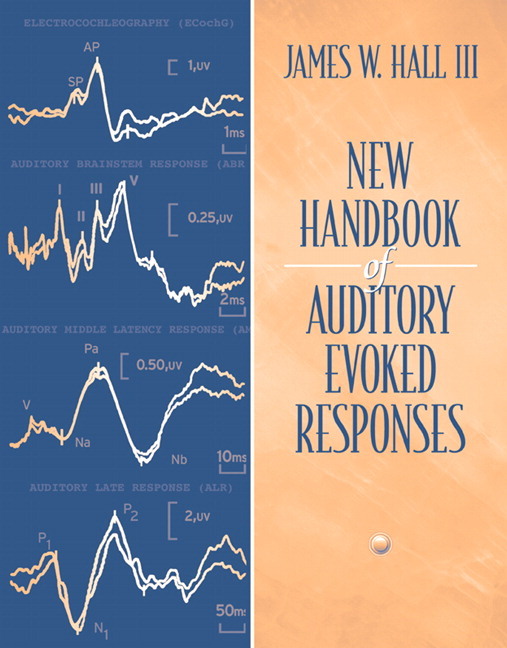 Written for graduate students and practicing clinicians, the New Handbook for Auditory Evoked Responses is an up-to-date and comprehensive source of practical information about auditory evoked responses, from electro-cochleography to cortical responses. Authored by a leading clinical audiologist who records auditory evoked responses daily in his clinical practice, this text maintains a consistent writing-style and difficulty level from beginning to end. The content is of direct interest to clinical audiologists and others involved in the clinical measurement of auditory evoked responses. The text includes extensive review of test principles, protocols, and procedures required for clinical application of auditory evoked responses. The practical coverage of material includes guidelines for trouble-shooting and solving problems commonly encountered in the field. Presents principles common to different auditory evoked responses, including anatomy and physiology and general measurement principles (Chs. 1-3), allowing students to learn the material from only this source without having to purchase an additional textbook to master the basics. Teaches students to record, analyze and interpret responses for various patient populations (Chs. 4-16). Includes readable and clinically oriented reviews of extensive literature on complex responses, such as the P300 and MMN (Chs. 4-16), making it the only textbook of its kind to present a balanced coverage of evoked responses recorded from the entire auditory system (cochlea to cortex). Reviews and relates the literature on auditory evoked responses in diverse pathologies to clinical practice so that students do not have to locate and read additional journal articles (Chs. 4-16). Illustrates important concepts, including the effects of measurement parameters and pathologies on auditory evoked responses, with hundreds of clear drawings, to help enchance student learning (Chs. 4-16). 1. Overview of Auditory Neurophysiology: Past, Present, and Future. 2. Anatomic and Physiologic Principles. 3. Introduction to Auditory Evoked Response Measurement. 5. Clinical Applications and Populations. III. AUDITORY BRAINSTEM RESPONSE (ABR) AND AUDITORY STEADY STATE RESPONSE (ASSR). 6. ABR Protocols, Parameters & Procedures. 7. ABR Analysis and Interpretation. 8. Frequency-Specific ABR and ASSR. 9. ABR: Pediatric Clinical Applications and Populations. 10. ABR: Adult Clinical Applications and Populations. IV. CORTICAL AUDITORY EVOKED RESPONSES. 11. Auditory Middle Latency Response (AMLR). 12. Auditory Late Response (ALR). 14. Mismatch Negativity (MMN) Response. 15. Electrical and Myogenic Evoked Responses. James W. Hall III, Ph.D. received a Masters degree from Northwestern University and, in 1979, his Ph.D. in audiology from Baylor College of Medicine under the direction of Dr. James Jerger. Since then, he has held clinical and academic audiology positions at the University of Pennsylvania School of Medicine, University of Texas School of Medicine-Houston, and the School of Medicine at Vanderbilt University. Dr. Hall is now Clinical Professor and Chief of Audiology in the Department of Communicative Disorders at the University of Florida in Gainesville. In addition to his administrative duties, he maintains a clinical practice at University of Florida Health Science Center, and serves as a clinical instructor and mentor in the Doctor of Audiology on-site and distance learning programs. Dr. Hall’s main research interests are in the area of auditory neurophysiology, clinical assessment of auditory processing disorders and central auditory nervous system function, newborn hearing screening, and tinnitus & hyperacusis. Dr. Hall lectures internationally on these topics. He is the author of numerous journal articles, monographs, or book chapters, as well as the Handbook of Auditory Evoked Responses and Audiologists’ Desk Reference Volumes I and II, the Handbook of Otoacoustic Emissions and the New Handbook of Auditory Evoked Responses.